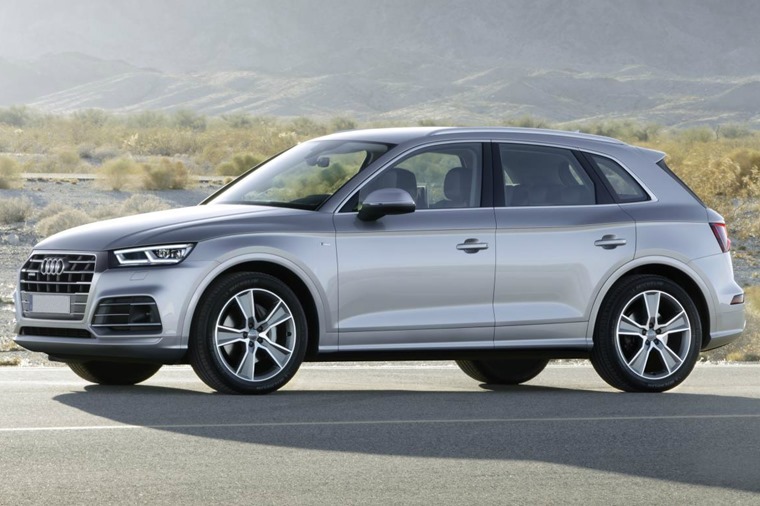 The Audi Q5 is an excellent car in nearly every respect. It’s easy to drive, capable on the road, reasonably good value to lease and relatively cheap to run. 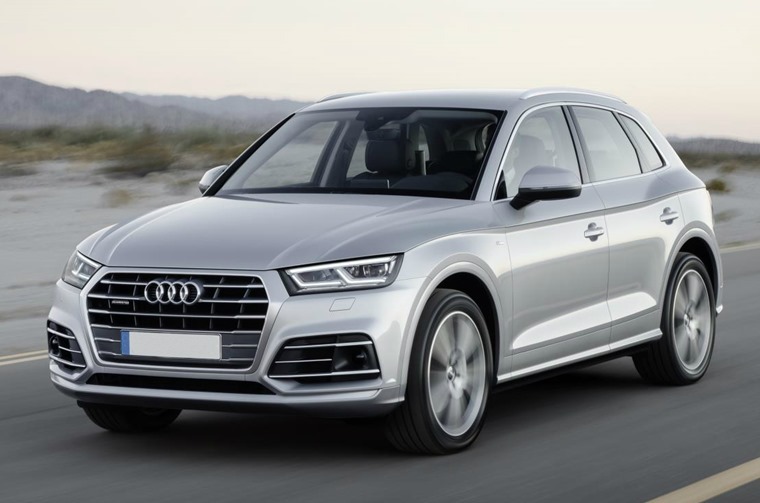 The Q5 is a heavy hitter for Audi, with buyers taking more than 1.6 million of the cars home since its launch in 2008, following on from the larger Q7. Since then a Q3 has appeared on the scene, and the trio will be joined by the Q4 and Q8 over the next year or so. It’s all part of the SUV-isation of the car market, drivers shifting from more conventional hatchback and saloon cars into crossovers and fully fledged SUVs. 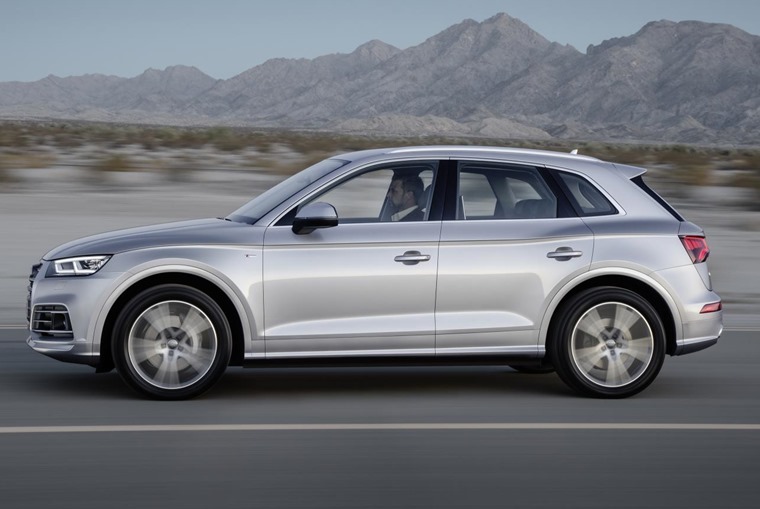 This new Q5 needs to be the best around to stay at the head of the sales charts. The market is booming and shows little sign of slowing down, with manufacturers falling over themselves to take a share of sales - even Bentley, Maserati and Rolls-Royce have humongous heavyweights available. There’s also more relevant competition from the Jaguar F-Pace and BMW X3, so this new Q5 needs to be the best around to stay at the head of the sales charts. Audi certainly hasn’t done much to scare off existing, sticking to a visual formula that pervades the entire Audi range - there’s an octagonal grille up front that leads to headlights that sweep back into an angular but elegant body. An octagonal grille up leads to headlights that sweep back into an angular but elegant body. It’s longer and taller than the outgoing Q5, but only just so it appears no larger. It is, however, around 90kg lighter, which is the equivalent of a sturdy man missing from the passenger seat, a change that will help improve handling and economy. Engine choices are conventional and predictable, with the 187bhp 2.0-litre diesel in this test car and a 249bhp 2.0-litre petrol engine available. It’s not difficult to extract some surprisingly significant performance from the Q5. The warmer SQ5 model makes do with a 3.0-litre V6 petrol engine that produces 349bhp, while extra diesel and petrol engines will make their way into the car over the coming months. 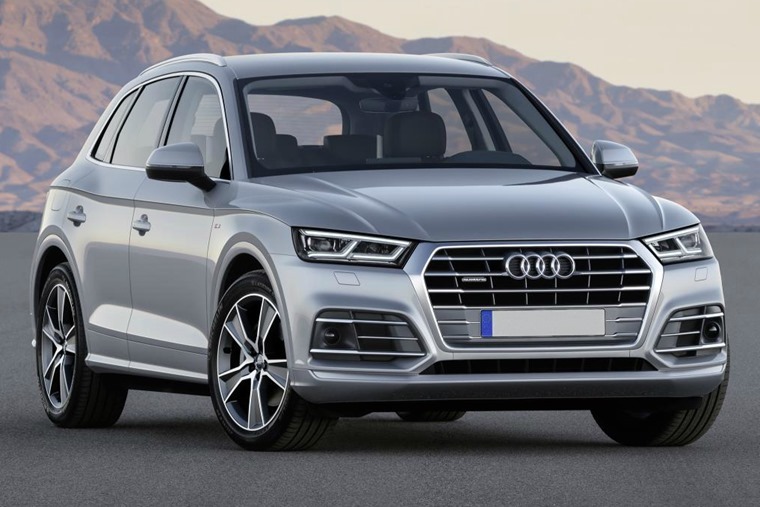 Allied with a seven-speed dual-clutch automatic gearbox and a more efficient version of Audi’s quattro all-wheel drive system, it’s not difficult to extract some surprisingly significant performance from the Q5. That drive system works in front-wheel-drive mode under normal circumstances, but wheel spinning away from junctions (or coming across an unexpectedly slippery bit of wet tarmac) sees the car shifting power around all four wheels. Combined with stiffer ‘S sport’ suspension, the handling is all remarkably ordinary. Not engaging or exciting, just capable but dull. It’s a vanilla milkshake, but a really good vanilla milkshake. It turns in at corners, goes around the corner without protest, then pulls away on the straight bits with minimal fuss. It’s a vanilla milkshake, but a really good vanilla milkshake. The same is true of the interior, where it’s another Audi effort that is magnificently built, and where everything works well. The dashboard is a master class in efficient design, while the £250 ‘virtual cockpit’ digital display in the instrument binnacle is an attention grabber. The dashboard is a master class in efficient design. This can be adjusted and reprogrammed on the fly to display Google Earth-based satellite navigation, details about music choices, car dynamics information, and any of myriad other options. However, after spending a long time using the system, the temptation is simply to set it to a digital representation of traditional analogue dials. 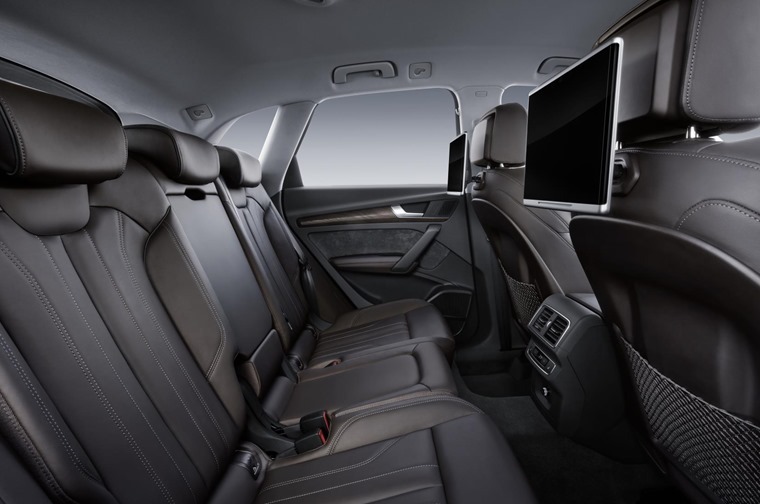 There's plenty of space around the cabin, some of which Audi claims is due to increasing the wheelbase by 1.2cm. While it's debatable whether that extra third of an inch makes much difference, there’s no complaints about the accommodation both front and rear. Goodies are festooned around the car, with a fantastic level of standard kit. The boot has grown slightly too, now taking 610 litres of whatever goodies you like to store in the boot of a Q5. Goodies are festooned around the car, with every model getting a smartphone interface, parking sensors, powered tailgate and adjustable drive modes as standard. However, arguable necessities at this level such as autonomous emergency braking, blind spot warning, sat-nav, rear-view camera and adaptive cruise control are all options, with some being quite costly. High residual values will undoubtedly keep leasing costs relatively low. Ticking a few boxes on the options list will soon see even an entry-level model break the tax-attracting £40,000 list price. Other costs should be kept in check, though. High residual values will undoubtedly keep leasing costs relatively low, while that 2.0-litre diesel engine can be encouraged to sip at fuel if driving carefully. Servicing is variable, with the right motoring meaning you’ll only visit the dealer every two years, or 19,000 miles if that clocks up quicker, while BIK is a manageable 28%. 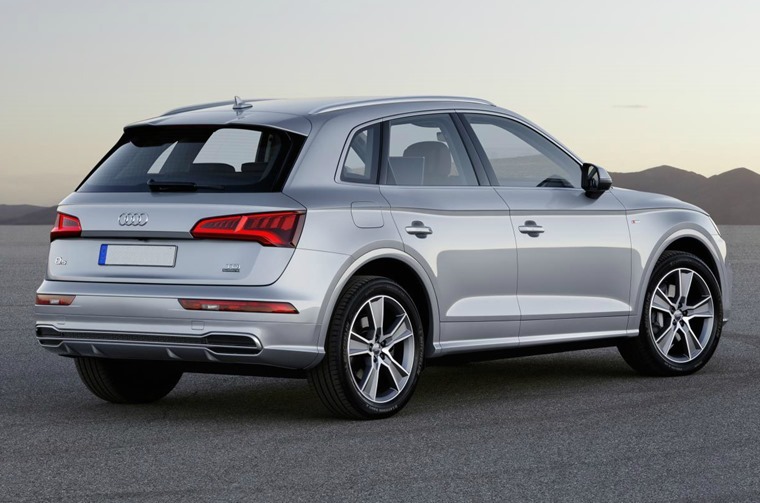 The Audi Q5 then is an excellent car in nearly every respect. It’s easy to drive, capable on the road, secure with its all-wheel-drive, reasonably good value to lease and relatively cheap to run. The F-Pace has a little more style about it, but the Q5 is clearly the better car. Another 1.6 million on the way then, Audi? *Average monthly lease rates calculated using ContractHireAndLeasing.com data and based on typical 6+35 10k deals. Correct at time of writing.